Throat pain, Removes mouth odor, Boots digestion. ◥ NOT recommended to be consumed by pregnant or nursing women. With this product, you earn 45 Reward point(s). 45 points = $0.45. Peppermint herb tea is a naturally caffeine-free tea which is a tisane infusion of peppermint, meaning that it is actually made from anything but the leaves of the tea bush. Peppermint is a mix between spearmint and watermint and has quite a high menthol content; it also goes well if you mix it with other herbal teas or even non-herbal teas. 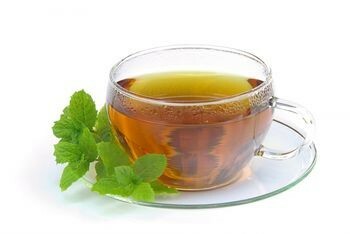 It has a very strong aroma, as well as flavor of mint because of its high menthol content. Peppermint herb tea is also versatile, which is one of the reasons it is quite popular, since it can be drunk either hot or cold. Though peppermint herb tea can be enjoyed at any time during the day, you will get extra benefits if you drink it before bedtime. Those times in the year when you are sick and falling asleep is hardly an option, you may wish you had drunk peppermint tea before bed more often. The reason is that peppermint herb tea acts as a great preventative force against catching the common cold or, worse, the flu. This kind of tea comes with good amounts of potassium, calcium and vitamin B, all useful agents in the fight against colds and flus. NOT recommended to be consumed by pregnant or nursing women.